This simple method of preparing pork shoulder (carnitas means ‘little pieces of meat’) makes a surprisingly addictive dish. The guacamole is made fresh in a molcajete (a traditional Mexican pestle and mortar) but if you don’t have a pestle and mortar, use a blender for the base ingredients and mash in the avocados with a fork. 1. For the carnitas, cut the meat, with the fat, into strips about 5cm x 2cm. Barely cover the meat with water in a wide, heavy-based pan. Add the salt and bring to a boil, uncovered. Lower the heat and let the meat cook briskly until all the liquid has evaporated – by this time it should be cooked through but not falling apart. Lower the heat a little and cook until all the fat has rendered out of the meat. Keep turning the meat until it is lightly browned all over – the total cooking time should be about 1 hour 20 minutes. 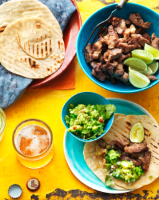 Make the tortillas and guacamole while it cooks – for the best flavour and texture, you want to serve the carnitas as soon as it’s ready. a little at a time, so you can see how much the our will absorb (you may only need 40-50ml). Using a dough scraper, gather up all the our around the edges and knead until evenly combined – about 2 minutes with a free-standing mixer or 4 minutes by hand. 3. Divide the dough into 10 pieces, about 35-40g each, and roll into very smooth balls about 4cm in diameter. Cover with well-oiled cling lm and set aside for at least 20 minutes, or up to 2 hours. a rolling pin to form a 15cm circle. it should sizzle if the heat is correct. The dough will become opaque and the bottom slightly browned in patches. Turn the tortilla over and cook on the other side; the whole process should take less than 30 seconds. Don’t overcook or the tortilla will become hard instead of soft and pliable. Repeat with the remaining dough. As soon as each tortilla is cooked, stack it on top of the others, covered with a clean tea towel. These tortillas keep well and can be prepared ahead, then reheated on a warm griddle. be smooth. Stir in all but 1 tbsp of the chopped tomato and season. Top with the remaining tomato, and the extra onion and coriander. Roughly chop the carnitas, pile into the warm tortillas and top with the guacamole before serving, with lime wedges for squeezing over if liked.